FACT CHECK: Does the Family of Former Attorney General Eric Holder Own an Abortion Clinic? Does the Family of Former Attorney General Eric Holder Own an Abortion Clinic? A seven-year-old cluster of news reports got a new lease of life on Facebook in April 2019. Family relatives of former U.S. Attorney General Eric Holder own property used as an abortion clinic. Holder's wife and sister-in-law are co-trustees of a family trust which includes a property at 6210 Old National Highway in College Park, Georgia, which since the 2000s has been the location of a clinic that performs abortions. Holder's wife and sister-in-law are only the trustees of the trust and cannot derive any material benefit from the property in question, which will ultimately fully transfer into the ownership of the women's niece and nephew. New documents a conservative publication obtained link Attorney General Eric Holder with a Georgia-based abortion practitioner responsible for killing a patient in an abortion and who has been accused of Medicaid fraud. Human Events says Holder has ties to Tyrone Cecil Malloy and that they help explain why Holder has failed to prosecute abortion practitioners who run afoul of federal laws and why he has bee eager to prosecute pro-life advocates who protest outside of abortion centers. Documents obtained by Watchdog show that Holder’s wife and sister-in-law co-own, through a family trust, the building where Malloy operated. A Georgia grand jury indicted Malloy on Medicaid fraud charges in 2011. A state medical board twice reprimanded the doctor. “I don’t own this property and my sister does not own this property. We are not technically on this deed,” Malone Tuckson said. However, public documents reviewed by Watchdog.org show that the family transferred ownership to a family trust in 2009, eight months after President Barack Obama’s inauguration. But even the new deed directly names Holder’s wife and sister-in-law as trustees. After inquiries by Watchdog reporters, Tuckson contacted the Fulton County Assessor’s office and asked them to change tax records to reflect the “new” ownership. In August 1993, Buford and Maxine Hearn sold the property at 6210 Old National Highway to Dr. Mack Arthur Jones, an OB-GYN who was married to Vivian Malone, the sister of Sharon Malone, Eric Holder’s wife. For a few years during the 1990s, Dr. Jones used the property as a women’s health clinic, but he transferred 6210 Old National Highway into his personal ownership by way of a quitclaim deed in December 1998. Mack Jones died in August 2004, and Vivian Jones died in October 2005. In a will which Dr. Jones drew up in 2001, he bequeathed several properties and assets to the couple’s children, Monica and Michael, and their respective families. Georgia real estate records show that in August 2009, Sharon Malone’s sister Margie Malone Tuckson acted as the executor of Dr. Jones’ will and transferred the property at 6210 Old National Highway into a two-part trust for the children, Monica and Michael. Sharon and Margie were listed as co-trustees. 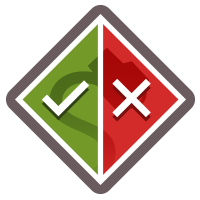 A trust is a three-way arrangement in which one party (the trustor) sets aside a certain asset or property for a second party (the beneficiary) but assigns responsibility for the asset to a third party (the trustee). A testamentary trust (as distinct from a living trust) is one which only comes into being after the death of the trustor. In their will, the trustor can set certain terms and conditions on the trust. A typical example of a testamentary trust would be a parent who bequeaths to their child a certain sum of money. However, in their will, the parent stipulates that the money can only be released to the child after they have turned 18 years of age and that if the parent dies before then, a named person (the trustee) will be responsible for looking after the money and have certain legally-binding duties to the child (the beneficiary) — for example that they cannot spend all the money in the mean time. Once the parent dies and the child turns 18, the trustee is obliged to fully transfer the money to the child. While the trust exists, the trustee has legal ownership of the money but will not ultimately benefit from the contents of the trust, and the beneficiary has “equitable ownership” of the asset. Once the asset or property has been fully transferred into the beneficiary’s ownership, the trust is dissolved. In January 1998, Tyrone Malloy formally registered “Old National GYN” as a for-profit business in the state of Georgia, and he moved that clinic into the property at 6210 Old National Highway in 2004, according to an account later provided by one of his employees. Malloy was convicted in March 2014 and given a four-year prison sentence to be followed by six years of probation. He was released early in 2016, and the Georgia Composite Medical Board reinstated his medical license in October 2017. In public records held by the Georgia Secretary of State’s Corporations Division, Malloy’s clinic was listed as being located at 6210 Old National Highway from 2007 until 2011, when Malloy dissolved the business. A new company by the same name was registered at the same address in 2014, with Malloy listed as the Chief Executive Officer, although his name has not appeared on similar annual registration forms in subsequent years. As of January 2019, Old National GYN was still located at 6210 Old National Highway. 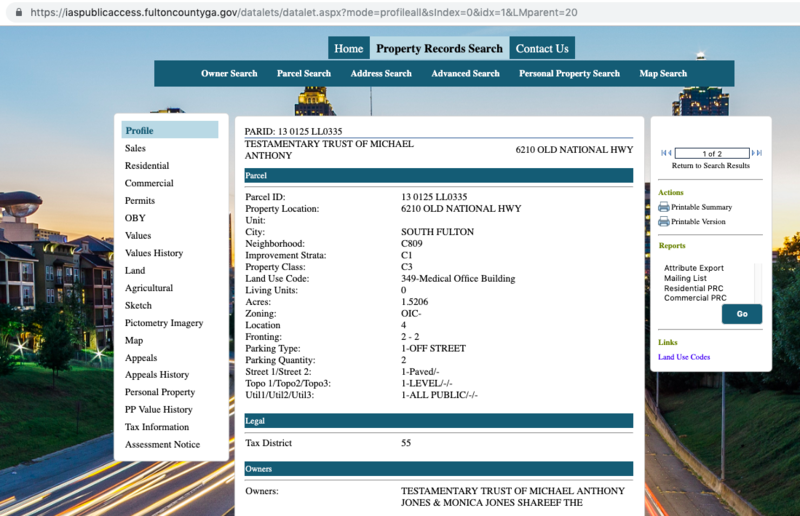 And as of 12 April 2019, the web sites of both the Fulton County Board of Assessors and the Fulton County Tax Commissioner listed the owner(s) of the property as “The Testamentary Trust of Michael Anthony Jones and Monica Jones Shareef” (the children of Dr. Mack Jones and Vivian Malone Jones). It appears that in 2012, when Human Events published their article linking Sharon and Eric Holder to Old National GYN, the website of the Fulton County Board of Assessors listed the owners of the property as “Margie Malone Tuckson & Sharon Malone Holder.” However, that entry was subsequently changed to list the family trust as the owner of the property. The claim made in the 2012 news reports was that family relatives of Eric Holder — namely his wife and sister-in-law — owned a property used as an abortion clinic. It’s true that Sharon Malone Holder and Margie Malone Tuckson were, and still are, co-trustees of a family trust that includes the property at 6210 Old National Highway. As such, one could reasonably argue that this means they have legal ownership of and responsibility for that property and have done so since 2009. And for most of that period, a clinic that performs abortions has been operated out of the property in question. However, their ownership of the property is not straightforward. Official public records list the owner of 6210 Old National Highway as the trust through which Dr. Mack Jones set aside various properties which will ultimately be transferred into the full ownership of his children, Monica and Michael Jones. In this sense, one could just as reasonably argue that the property’s true owners are Monica and Michael Jones, and not their aunts Sharon Malone Holder and Margie Malone Tuckson, who are co-trustees of the family trust — and as such, will not ultimately derive any substantive material benefit from the property. We submitted similar questions to Sarah Holmes, who is listed in public records as the registered agent for Old National GYN, including asking her whether the company paid rent to the owners of 6210 Old National Highway. By email, Holmes told us she was unable to answer our questions. Finally, moving beyond the ownership of the property at 6210 Old National Highway, no evidence exists that either Eric Holder, Sharon Malone Holder or Margie Malone Tuckson have played any role in the operation or management of Old National GYN, and none of them has ever appeared on annual company registration documents held by the Georgia Secretary of State’s Corporations Division. These facts significantly undermine connections drawn between the then-Attorney General and his wife and the actions of Dr. Tyrone Malloy. Human Events. 31 October 2012. The Atlanta Journal-Constitution. 29 August 2018.